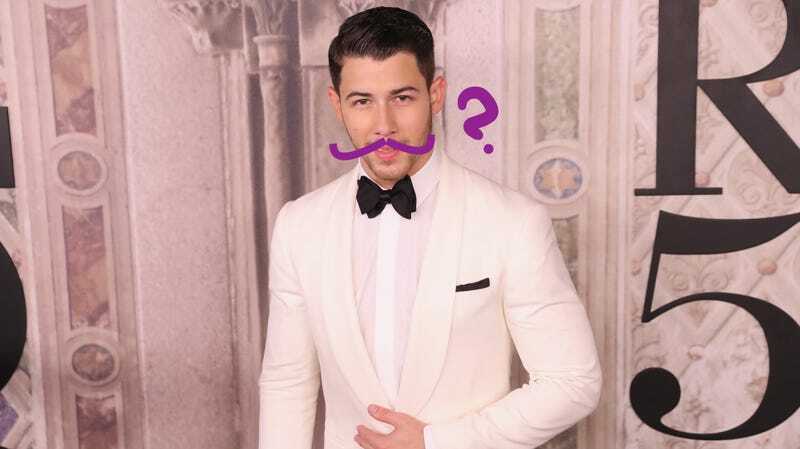 Can You Find Nick Jonas's Mustache? Nick Jonas—“Jealous” singer, turkey jerky fan, inarguably the hottest member of the Jonas Brothers—has a dirty secret and it’s been right under his nose this entire time. Or has it? We’re not talking about his engagement to Priyanka Chopra because that has been confirmed, love is real, etc., etc., whatever. This is much more deviant. Picture Nick Jonas. Handsome, right? But does he have facial hair? Are you sure? Maybe some scruff. Maybe a full beard—no, that’s not right. A five o’clock shadow? Does he have a mustache? A goatee? A faded chinstrap? Are you okay? I’m here to report: he does have a ‘stache, sort of. But where in the world is it? Have you seen it? It’s here, on his face, the world’s smallest stache. Thank you. Don&apos;t Mock Nick Jonas&apos;s Height, It&apos;s Just Rude. Very Rude.